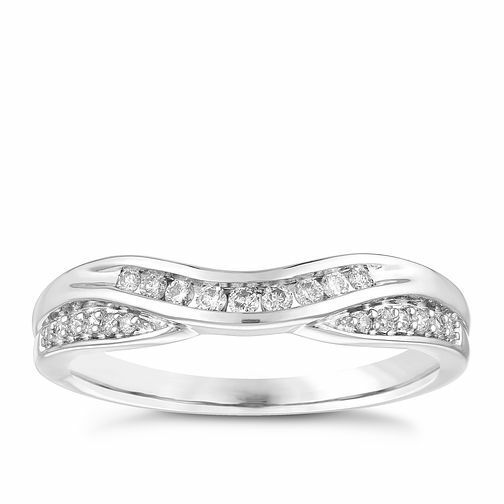 18ct White Gold 0.15ct Diamond Set Shaped Wedding Ring is rated 5.0 out of 5 by 1. Rated 5 out of 5 by Anonymous from Top Marks I picked this ring out to replace my wife's wedding ring which we bought when we were penniless. This is a great replacement. I have to admit I did order the wrong size to begin with but H Samuel were very good and sent it back for me no hassle and the replacement for the correct size arrived very quickly. The ring looks great, sparkles and fits well. The staff were very friendly and helpful too and said should it still not fit then resizing would not be a problem. Would definitely use again. Look out for their sales as they have some great bargains plus if you sign up to the newsletter you can score another 10% off. Very happy with service and product.